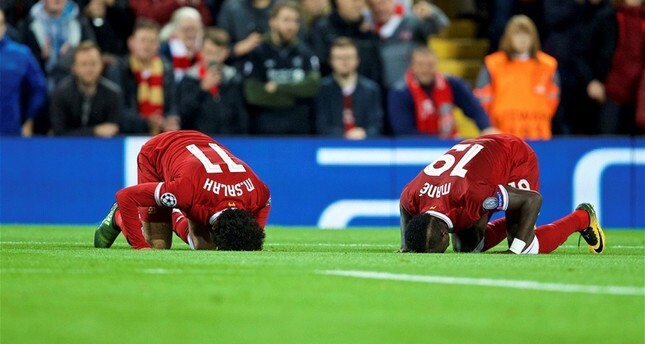 Liverpool’s Mohamed Salah, left, and his teammate Sadio Mane performing sujood, or prostrating in Muslim prayer, during the UEFA Champions League Group E match between Liverpool and Sevilla at Anfield.Liverpool, U.K.
Liverpool’s Muslim wingers Mohamed Salah and Sadio Mane will be fasting on the day of the UEFA Champions League final, British media outlets reported Thursday. The final comes amid the holy Muslim month of Ramadan during which the faithful are required to abstain from eating and drinking during the daylight hours. Sunset — the time for iftar, or the fast-breaking meal — is expected 30 minutes before the kick off in Kiev. This means the cornerstones of Liverpool’s attack in their showdown against Real Madrid will only have half an hour to hydrate and replenish their energy after the 17-hour fasting. According to reports, Salah, who decisively rejected the idea of breaking the fast earlier, believes it will not affect him. Liverpool led by Salah, who scored 44 goals across all competitions in his debut season at Anfield, will try to end Real’s two-year reign in the Champions League at the NSC Olimpiyskiy Stadium on May 26.